Task cards have been around for several years. I have read about them in blog posts, seen them on Pinterest, and thumbed over them in catalogs. It was just recently that I became intrigued enough with the cards to give them a go. As a librarian, I was naturally drawn to the creation of research-based task cards. Task cards are great tools to use both in the classroom and the library. Task cards are exactly that … a card with a task. Each of my research task cards states one fact and then asks three questions pertinent to that fact. Each question is easily researched and facts would be found in multiple resources. Why research based task cards? Researching the answers to simple questions is a multi-skill task. It requires students to read for comprehension, identify key words, locate pertinent articles, scan for information, and seek accurate answers. Kids also seem to genuinely enjoy quick research based questions. It gives them an opportunity to explore new information! How can I use task cards? Task cards are perfect for center work, for differentiating instruction, and especially great for your fast finishers. Here are a few popular ways that educators are using task cards. Research Centers: Set up a center with books, encyclopedias, and technology! Add the cards and VOILA!! Scoot: Post the cards around the room. The students can walk about and complete the task cards. You can set up certain books at each card, or even send them around the room with technology such as tablets. Bulletin Boards: Use the cards to create an active engagement bulletin board. Display the cards and place the answer sheets nearby. Consider creating more than one copy of the card. Then kids can take one copy back to their seats. Bundle the Cards: Cards can be stored in lots of different ways. After cutting and laminating the cards, punch a hole in the upper-left hand corner and put a binder ring through them all. Store them in those colorful plastic soap boxes that you can purchase for just a couple of dollars. Task cards also fit perfectly in those inexpensive photo albums. Are you ready to give Task Cards a go? I have made it super simple for you to try!! 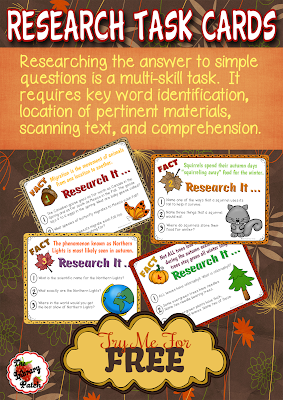 Click HERE or on the picture at the beginning of this post and download an Autumn Sampler of research task cards. The FREE sampler includes a set of four colored task cards, the same four cards in black and white, a recording sheet, and an answer key.